Home › (GM) General Musings › MLB › Is Starlin Castro an Asset Anymore? It looks like a crowded middle infield right now in Wrigleyville. According to a Bruce Levine tweet, Starlin Castro is officially a utility man, making way for Addison Russell to begin his reign over Wrigley Field’s shortstop position. Why weren’t the Cubs able to move Castro before the deadline? Are other MLB teams uninterested in the services of Starlin? Would you have wanted your hometown squad to make a move to pick up Castro before the deadline? Let’s take a look at Starlin’s YTD 2015 statistics. 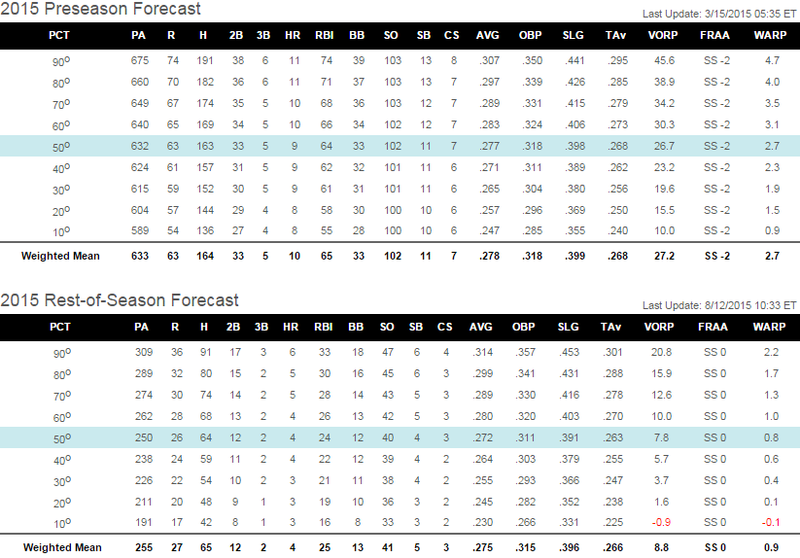 Starlin has underperformed to say the least – even worse than his worst-case scenario Preseason Forecast (the lowest WARP value in the preseason forecast was 0.9 and Castro currently has a -0.1 WARP – according to Baseball Prospectus). Even OOTP predicted a sharp fall in performance from Castro in 2015 (simulated through yesterday’s date). OOTP correctly predicted Starlin’s starting role would diminish – note he only started 12 of the 49 total games he has played in in this simulation. But does that mean that Starlin is no longer worth the chance? He is a 25-year-old, 3-time all-star, and he can probably learn to play 3rd and 2nd base to make himself more playable. Despite his WARP values trending downward over the last 4 years, I think he has more in the tank. OOTP still has Castro ranked as a 74 out of 76 (80 is the highest possible grade). And although I have seen these ratings fall quickly after 1-2 years of bad performance, I find it very hard to understand why there were 0 teams willing to make a bet on Starlin at the trade deadline. The Yankees have desperately searched for an answer at 2nd base. The Angels have Johnny Giavotella as their starting 2nd baseman (yes I admit his WARP is 0.3 but thats not THAT much better than Castro). The Mets just didn’t want to make Wilmer Flores cry, otherwise Starlin would have fit well in Queens too. And with all the moves the Padres made during the winter, I was shocked not to see them scoop up Castro, with Amarista/Barmes not exactly electrifying the crowd in San Diego. 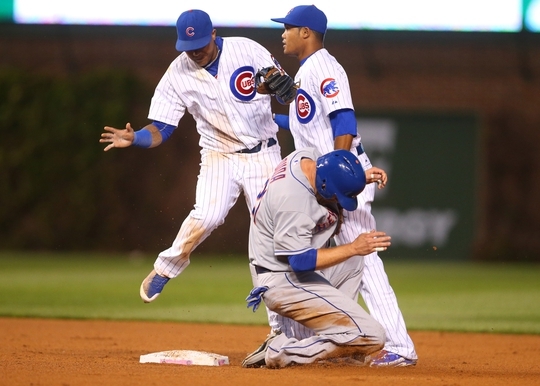 Is Starlin out of time in Chicago? Is there anywhere else he might land?